1) Preheat oven to 180C or 350F. Generously butter a large loaf tin (23 x 13 x 6cm) and either line it with butter parchment paper or dust with flour. Set tin aside. 2) Sift flour, baking powder, soda, salt, pepper and mustard powder into a large bowl. Whisk with a whisk to incorporate the dry ingredients. Add both cheeses, olives, sundried tomatoes, spring onion, parsley and thyme and stir them thoroughly together. 3) In a separate bowl, whisk the eggs, then whisk in the oil and buttermilk until they are well combined. 4) Make a well in the center of the flour mixture and pour in the wet ingredients. Stir together to form a thick, sticky batter. Scrape the batter into the prepared tin and spread it out evenly. 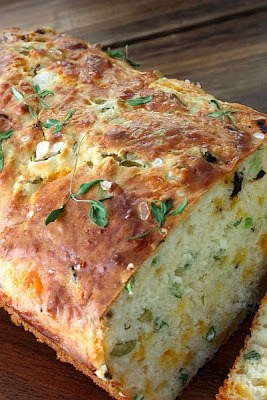 5) Brush the top of the batter with the egg wash and then srpinkly some thyme leaves and sea salt onto the loaf. 6) Bake for 40 - 45 minutes or until a fine skewer inserted in the middle of the loaf comes out clean. If the top starts to burn, place a piece of foil to cover the top of the loaf and continue baking. Leave in tin for 5 minutes before turning ot onto a wire rack. 7) This loaf is best served on the same day. Wrap left overs tighly and store in fridge. Gently reheat in oven if serving left overs.